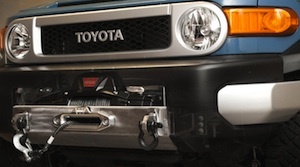 Let us know how you feel about the FJ Bumper Wing Replacements. You gotta get some for the back too. I would get a pair, but not just for the front… wouldn’t look right. Lots of people have aftermarket front bumpers too and want to eliminate just the rear wings. I worked on rear ones for a while, but decided it was too much trouble. I would have to charge too much, you would be better off buying an aftermarket rear bumper. They are a difficult problem. Once you take the wings off, the angles of the bumper are irregular and stick out. To make them flush mount you would have to cut away too much plastic to be able to mount them effectively. If you made them more 3D to get around the parts that stick out you would risk doing more damage to the plastic quarter panels. The aluminum would not break off like the plastic ones and would could tear the quarters out. These are great. I broke one of my wings off on the trail. Nice inexpensive solution and I never have to worry about it again. They will do just fine and look pretty good, till I can afford a new bumper. Hey would you consider you producing these in black plastic, either plain or diamond plate style? Should be a fraction of the cost to make or buy. Thanks. Sorry, no. I’m not a fan of a plastic solution. Yes, they would be a fraction of the cost, but in my opinion they look cheap and flimsy. What is the ship/receive time to Dallas/Fort Worth if I were to order today, June 22, 2016? These are real nice and I’d like to purchase, based on the receiving time. Anything selectable on the purchase page is in stock and ready to ship. I can ship within a day, 2-3 days delivery, tops. Do you still make these bumper ends? Any progress on a solution for the rear bumper? Not at this time. Unfortunately, a tree fell on my FJ last year and I no longer have a donor vehicle for a model. But aside from that, I don’t think it’s a good solution. I think changing the wings on the rear to something less breakable would put the quarter panels at risk.